I’m back. Back to regular deadlines, back to grocery lists and prescriptions to fill, back to bills and vacuuming and the other mundane tasks that fill most of our everyday lives. The silver lining: I am also back to regular running. And it’s awesome. While we were gone, winter changed its RSVP on the great evite of life from “maybe” to “no.” The ski season that was limping through the fake-outs that were January and February is now officially over, and if I don’t slather some sunscreen on my arms before heading out for my every-other-day 5-miler on the beach, I have a thick watch tan-line on my left wrist when I get home. It’s ideal running weather—warm enough to not bother with the half-zip, but not so hot it’s slowing me down or reducing me to a puddle of sweat before I even get out the door. And now that I’m running more regularly again, my mind is turning to thoughts of upping the ante on the slow, easy recovery runs that helped my legs get through ski-patrol training this past season. I’m not actually speeding up or adding distance, just contemplating some events that might encourage both—the Frederick Half-Marathon in early May, the Virginia Beach Rock ‘n’ Roll Half Marathonover Labor Day weekend. The Osmanthus Trail, where we did part of our run yesterday. At the same time, I’m enjoying the simple pleasure of heading out for a run with no distance or speed requirements, as I did yesterday, when Steve and I explored First Landing State Park. 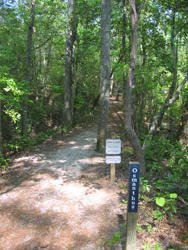 The 19 miles of trails wind through cypress swamps, rolling dunes and pine forests. The morning was misty and a little bit cool, and after we finished the 5-ish-mile loop, I felt like I could’ve gone 10 miles more. It was the kind of run that made me remember why I love running to begin with, and the kind of run that makes getting back to a regular routine that much easier. Glad you’re back too. And the weather has been bliss! One of these Tuesday nights you’ll have to come run trails with me! Yes! Come run Frederick with us! Great to have you back in my RSS reader Amy! I’ve just started running so I hope you’ll motivate me throughout summer! Your run sounds wonderful-wish I had trails close to home. Sometimes returning to mundane tasks can be therapeutic, as is nice “easy” (beachy) runs! And what a great way to explore your new area – by foot! Happy running! So glad you are back. I missed your words.